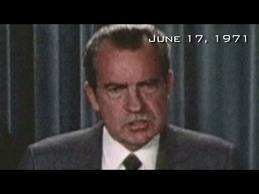 At a press conference on June 17, 1971 then President Richard Nixon informed his constituents of a troubling menace. “America’s public enemy number one in the United States is drug abuse.” Nixon also labeled those associated with drug abuse primary enemies of the state. “In order to fight and defeat this enemy,” Nixon charged, “it is necessary to wage a new, all-out offensive.” Sadly, this all-out offensive has been in full bloom under the modern War on Drugs while drug abuse—keeping in step—has also flourished. Drug scholars often discuss the problematic frame of the War on Drugs as an issue of criminal justice. Scholars argue that we must view drug abuse as an issue of public health. Despite his policy, Nixon’s public law and order rhetoric encouraged the nation and its policymakers to view drug abuse as a problem of criminal justice. Nixon explicitly and intentionally emphasized links to drugs and crime. This naturally obscured larger, more complicated problems of social and economic inequality, diminishing manufacturing strength, and broader social unrest. When Nixon spoke of rising drug abuse, crime and disorder, he typically condemned urban districts. After all, this is where the drug abuse and sales happen—in places like the Bronx or Bed-Stuy, Baltimore, or Oakland. This too has become a cultural truth throughout our modern War on Drugs. As Khalil Gibran Muhammad has argued in passionate detail, when we talk about drugs and crime we tend to generalize and condemn minorities and urban districts. But when crime or drug use becomes a large and visible problem in white suburban or rural districts, conventional logic and explanatory tools pivot to alternate explanations. When heroin abuse befell a state that is 95% white, boasting the nations fifth-lowest unemployment rate it naturally aroused curiosity, and concern. Vermont’s heroin problem is not just interesting because it confuses and challenges our standard narratives regarding drug abuse. With a different set of users, Vermont’s case is re-framing the problem of drug abuse. While re-framing the problem, Vermont is also still applying many troubling, enduring tropes of the War on Drugs. David Courtwright has long reminded us that what we think of particular drugs and how to respond to them as a society is often dictated by how we view its particular sets of users. When cocaine was the party favor for Wall-Streeters and Rockstars our policymakers did not yell fire. When a marketing innovation brought crack-cocaine to the poor, all parties sounded the alarm. Similarly, our explanations and responses behind heroin abuse have now changed. Sound policy steeped in punishment—it turns out—make much more sense when applied to 1970s Harlem rather than the land of maple syrup, autumn foliage, and good neighbors. 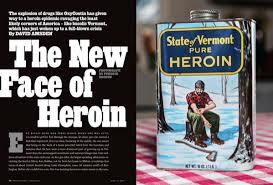 Emerging to give a much different speech about heroin over forty years later, Governor Peter Shumlin gave his State of the State Address on January 8, 2014. Shumlin devoted the entire address to heroin, and what to do about it. Initially, Shumlin sounded like any other tired drug warrior, railing about the “rising tide of drug addiction and drug-related crime spreading across Vermont.” Drug warriors love tides and fires. Both out-of-control forces of nature designed to remind listeners that the “crisis” is spreading. Drug warriors also like linking drugs with crime. “In every corner of our state, heroin and opiate drug addiction threatens us.” Highlighting the threat of drug abuse is nothing new. Where Shumlin distinguishes himself is in how he frames the threat. Rather than paint drug abusers or drug peddlers as the threat to be contained, Shumlin points to heroin itself, and addiction. The major goals of our modern War on Drugs have been quite simple: reduce the accessibility of problem drugs by attacking supply, thus reducing supply and thereby raising street prices. Enter unintended consequences. First, policymakers naively believed that they could price addicts out of the market. This, not drug use, lead to petty street crime. Second, in other cases, addicts simply found substitutes when their drug of choice became inaccessible or too costly. In a rare “success” story from the perspective of drug warriors, we have recently reduced the accessibility of OxyContin and significantly increased its street prices. While this may have signaled less abuse of OxyContin, this development inevitably led to the rise of its natural substitute, illicit heroin. And so the perpetual game of narcotic whack-a-mole continues. Like a child pushing uneaten vegetables around his plate, we are simply re-apportioning problems, not diminishing them. Following his narrative of victimization over condemnation, Shumlin also sought to re-frame the heroin problem in terms of public health. “The theory has been that if we just arrest users and put them away, then we’re going to make progress. Public policymakers have refused to say not only that this has failed, but that it’s failing miserably.” The concern now rests upon who our policies are failing. With a new face of heroin abuse, different, more compassionate responses follow. “We must address it as a public health crisis, providing treatment and support, rather than simply dolling out punishment, claiming victory, and moving onto our next conviction.” Referring to Vermont heroin abusers as “desperately sick,” Shumlin reminded his constituents of an old problem—a lack of treatment centers and open beds. Even better, Shumlin chided his constituents for blocking the construction of such centers near their neighborhoods in the past. Perhaps most crucial, Shumlin did not simply appeal to fuzzy ideas about compassion and morality that too often fall on deaf ears. Reminding voters of outrageous prison costs, Shumlin argued, “it is also the right thing to do for our pocket books.” Under the Affordable Care Act (as Shumlin noted), states will finally have help on this front previously limited by paltry block grants for treatment and rehabilitation. The legislation requires coverage for substance abuse disorders and treatment. Most importantly, it pledges federal support to pay for it. It seems clear that Governor Shumlin and others want to frame the heroin issue in terms of public health. Dr. Fred Holmes, a man treating the same children from the same families for 43 years, illustrates the point. According to Holmes, we must view the problem, and deal with the problem much as we would, “diabetes or epilepsy or asthma or ear infections.” Regardless of individuals personal beliefs regarding addiction and drug abuse, we can all agree that punishment has failed. In the face of this failure, Governor Shumlin is pushing for alternatives. 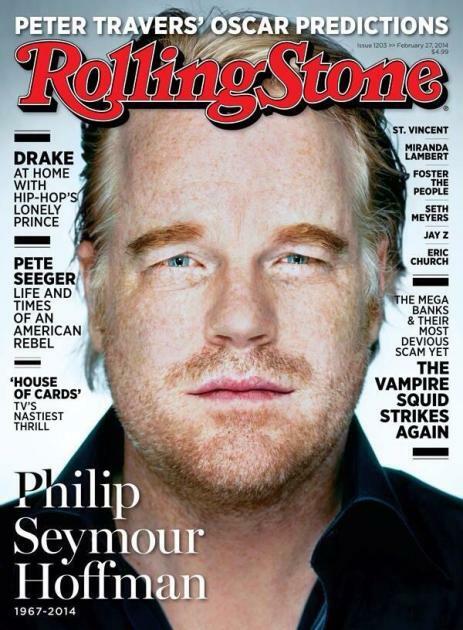 With conspicuously white, non-urban Vermonter’s as the new face of heroin abuse, he may stand a chance. Ultimately though, we must create a culture of collective empathy for addicts—not scorn. Moreover, this empathy must extend to all addicts—not just Shumlin’s constituents. 1. The Harrison Act did lead to a dramatic reduction of medically related dependencies and segregated the newer class of street-market users as an outsider criminal class, evidenced by the closure of the municipal maintenance clinics. 2. The two Congressional anti-heroin Acts conceptually separated heroin from the other opiates, creating a “demon drug” — a false classification that is now complicating attempts to deal with non physician-supervised use of opiates and the resultant deaths. These were the foundation stones Nixon built on. He may have been more ruthless and driven by ulterior motives, but he was following a well-marked roadmap. Thank you for your comments. I absolutely agree that Nixon did not begin the criminalization of addiction. David Courtwright (referenced above) makes this perfectly clear as do scholars such as Joseph Spillane, Kathleen Frydl and Curtis Marez. I did not intend to, nor would I make such a claim. With respect to this post I’m more interested in how our approaches to addiction are often contingent upon the addicted populations in question. Is drug abuse a criminal or public health problem? 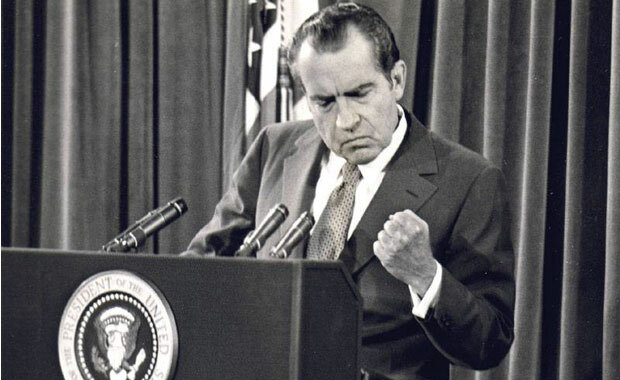 President Nixon successfully tied drug to crime and urban rot during his Presidency. Sadly, this view of drug abuse has held sway for the past 40 years. In a post from Points blog Michael Durfee argues that there are signs that American drug policy has begun to shift in its approaches to heroin abuse. Vermont’s governor Peter Shumlin and Eric Holder have recently been emphasizing that the heroin problem in Vermont is a public crisis, not a criminal one. While I rarely (this may be the very first time) have anything good to say about Nixon, his approach to drug abuse was far from unified. His administration strongly supported the then-emerging methadone maintenance clinics, and his early drug-control budgets allocated about one third of their funds to medical approaches to “addiction”. It was not until Reagan that the War on Drugs shifted to a total police-oriented, non-medical system. The recent shift back to more use of non-criminal techniques may be attributed primarily to demographics — non-heroin opiates have made widely publicized incursions into non-black, non-inner-city teen populations.